Lots of people, including National Geographic, are using the coming zombie apocalypse as a way to introduce disaster training in a humorous way. But it does raise an important question since we face a variety of different disasters in addition to zombies. How much should you prepare for a potential disaster? The standard economic answer is that you should compare the cost of making preparations with the expected benefits from surviving a disaster in the future (expected benefits are the benefits from preparation multiplied by the probability that the event happens). The basic idea is that the higher the probability of the event, or the worse the event is, the more you should spend in preparation. It’s worth it to prepare for a low cost but high probability event like an ice storm. It’s also worth it to prepare for a high cost but low probability event like a big earthquake. But you want to be careful not to confuse the extremity of the event with the benefits of preparation. 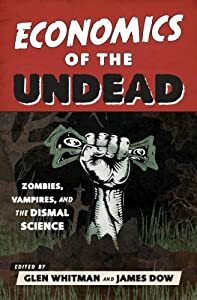 As the dangerousness of zombies increases, it seems like you should spend more on preparations; however, if you imagine zombies to be so dangerous that no one will survive, then it’s optimal not to prepare at all. National Geographic asked their interns about how they would fare when the zombies come. My interpretation of Caroline’s curl-up-and-die strategy is that she is indeed taking a rational response to expectations of a very extreme zombie event. Josh too, although he’s definitely looking on the bright side. This entry was posted on Friday, June 27th, 2014 at 11:48 am	and posted in Uncategorized. You can follow any responses to this entry through the RSS 2.0 feed.